First of all I want to say that SE is really great! I was wondering if it would make sense to add an other layer of hierarchy in the description of barycenter, cluster and nebulae. The idea would be to state that those elements belong to a galaxy and have coordinate compare to the galaxy center. 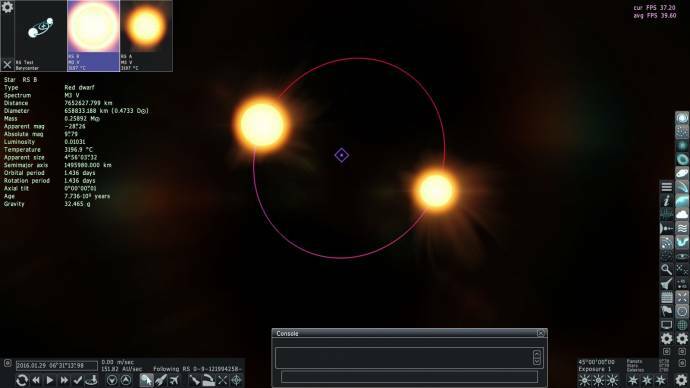 This would allow to "easily" place such elements in a custom galaxy and could also help to make everything in the galaxy rotate around its center. I suggest one small thing.I would love to see meteors in planets with atmosheres.This event would happen every now and then. SpaceEngineer has this on his TODO-list. OMGspace_engine, that is actually a pretty neat idea. Cool as idea and also, it could be already used for positioning objects with the new fixed (orbit) method and if one manages to make such structures the cities for example, it could serve as good will have to be patient. But I think it should not be fixed but movable. So I think, all HUD elements should be movable. And the console should be resizable, so that, for example, only the input line and an output window will remain, that is one or two lines in size. Mainly it bothers me that the left sidebar covers part of the info text. It could also the text be moved when the bar is visible. But I know that's probably just me - with my small screen and with my habit to have open all HUD elements - who has this problem. Another reason why I think it would be good if the HUD elements were movable. If I use two monitors, a part of the HUD elements are not visible. Here's one I thought about yesterday, and posted on the wrong thread: having the game's music distort when the atmosphere is denser or thinner. having the game's music distort when the atmosphere is denser or thinner. What I meant is that when you're in the vacuum of space, the music would sound as if you were hearing it inside a spacesuit, or something along those lines. And when you enter the atmosphere it would distort. Plus, it could be enabled and disabled in the game's settings. Through a console script? As an example, if I have a number of scripts that show a different level of development of a star? Then they could be activated by a console script sequentially. A shortcut would be enough already. I could then replace the .sc scripts with a batch script and activate with AutoHotkey!